Archer on Airguns: Which QB78 Parts Fit My Crosman 160? Which QB78 Parts Fit My Crosman 160? We're often asked this question here at Archer Airguns! The answer is that many QB78 parts do, in fact, fit the Crosman 160, and also the Crosman 167, Crosman 180 and Crosman 400 models. We publish a list of individual part compatability at http://www.archerairguns.com/crosman-160-airgun-parts-s/24.htm and also list the main parts kits that are available to keep these classic American air rifles in service. And how to fit them? That's where our QB78 Family Workshop Manual comes in. 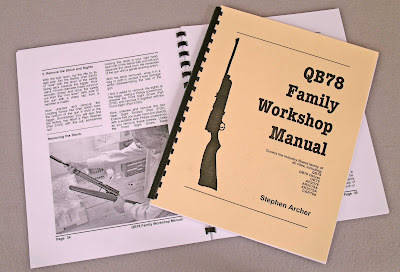 This unique 88-page publication gives the information required to make repairs not only to the QB78 family, but also the Crosman 160. The Crosman 167 and 180 models are very similar and can also be repaired using these instructions as a base. The Crosman 400 is, however, a completely different issue. It's a far more complex air rifle due to the magazine system and we recommend professional repairs for that reason, even though some of the QB78 parts will fit that fine airgun. The AR2095. The Air Rifle That Never Was.